When it comes time for Secret Recipe Club assignments, I always feel a little like I’m opening a Christmas present when I open the email from our group organizer, Jane. Who will it be? Do I know them? What will I make? This month my email led me to Megan’s Cookin’. Megan is new to me, but that doesn’t mean she’s not fabulous. She’s got tons of content to choose from, and I really really struggled with what to make. When I choose a recipe for SRC, I like to go back to the oldest recipes. As someone who’s been blogging a long time (in blogging terms, anyway), I know that while my oldest photos are shocking, the recipes I blogged first are often the ones I’m most passionate about. Things like my mom’s salsa, or breakfast tacos. I like to think it’s the same for a lot of bloggers, so I like to bring light (and traffic) to a recipe they might think is long since forgotten. As soon as my email arrived yesterday morning, I started digging through Megan’s archives. We were having friends (and it turned out, 5 more friends than we originally planned!) over for a barbecue, and I was in desperate need of dessert inspiration. Suddenly I stumbled on Megan’s Strawberry Cream Diet Pie. Something about the creamy filling and crisp cookie crust called to me. For a while now, I’ve been meaning to use the new Newton Fruit Thins Lemon Crisp flavor to create a pie crust. From the moment I tasted them, I knew they would be fabulous in some sort of cheesecake-type application. Megan’s pie was exactly the push I needed to make that idea a reality. What can I say? This is probably the easiest pie I’ve ever made. According to Megan’s site, each slice is only 2 Weight Watcher’s points. I’m not sure if my changes (using the Fruit Thins instead of graham crackers for the base, using Chobani Greek Yogurt) increase or decrease that situation in any way, but I can tell you that this makes for one crazy delicious pie. Megan’s original recipe is strawberry and chocolate. With the Lemon Crisp cookies, I was planning to make a lemon pie from start to finish. But my whirlwind flit through Target meant I didn’t pay quite as close attention as I should have. I grabbed Pineapple Chobani instead of Lemon Chobani. And poured it into the pie filling before I noticed the happy little pineapples staring up at me from the quickly-torn-off Chobani foil lids. Hoping for the best, fearing for the worst, I threw the pie in the refrigerator. I’m happy to say that Megan’s recipe can now be certified fool-proof! Or at least, this particular fool-proof. 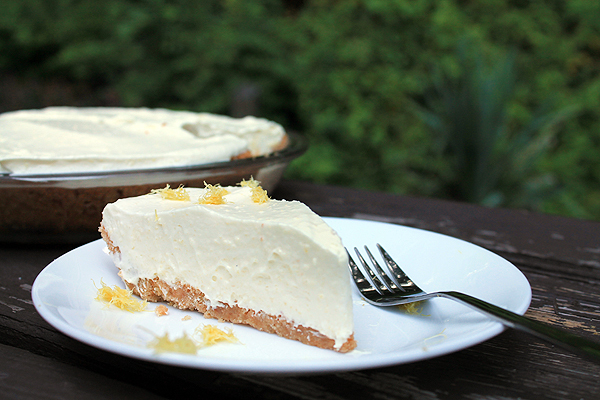 It turns out lemon and pineapple are pretty much a marriage made in pie heaven. Light, creamy, with that perfect crunch from the cookie base. This is a pie you want to make when you have an unexpected crowd or an unexpected craving. It’s lovely and versatile. Follow Megan’s recipe to a tee, or mine, or pave your own road by subbing in your favorite Jell-O and yogurt flavors. The world is your pie-oyster. Place all 15 cookies in the bowl of a food processor. Pulse until the cookies resemble coarse sand. Pour into a small bowl. Add the sugar to the crushed cookies and whisk it to combine the sugar evenly through the cookies. Melt butter in a measuring jug in the microwave (it takes about 60 seconds), then pour over the sugar-crumb mixture. Continue stirring the mixture until all of the cookie crumbs have butter on them and the entire bowl resembles wet sand. Pour the mixture into a 9″ pie pan and use a flexible spatula or your clean and dry hands to press and flatten the crumbs to line the pie pan evenly. Bake for 10 minutes. Allow to cool completely. You will not need the oven anymore, so remember to turn it off. Pour the packet of lemon Jell-O into a large bowl. Use a kettle to boil water, and add 1/4 cup of it directly to the Jell-O. Stir the Jell-O briskly with a whisk until the Jell-O fully dissolves in the water. Allow it to cool a bit, then add the containers of yogurt directly to the Jell-O and stir until completely combined. At this point, my pie crust still wasn’t quite cool, so I put the yogurt filling into the refrigerator along with the Cool Whip container and waited until the crust was completely cool to the touch before moving on to the next step. When the pie crust is completely cool, fold Cool Whip into the yogurt filling and continue to stir until the mixture looks completely incorporated. Pour the filling into the pie crust and smooth it over to create an even, rounded top. Refrigerate for at least 2 hours, and then serve. 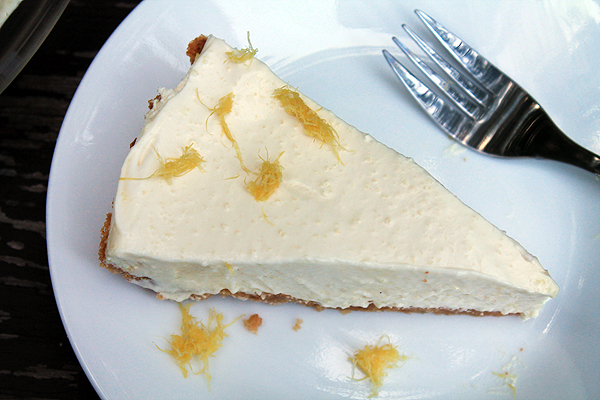 You can top it with lemon zest or dollops of whipped cream, or simply as is. Definitely forgiving. I’m pretty sure I could have picked up any yogurt flavor to combine with the Lemon jello and we’d have been okay! This pie sounds sooo delicious! Yum! It definitely was! Thanks for stopping by, Katrina. I love your twist on her strawberry pie! I made her version when I was in Weight Watchers but think I’d like yours even better. YUM! Veronica, that pie is so versatile! I think you should create your own flavor combo for us all to try. What a genius flavor combination (you never should have told us it wasn’t on purpose!). This pie looks so refreshing. Just what is needed on these hot summer days! I’m waiting for you to turn it into a mini-pie recipe, because a whole 9 inch pie was a little much for just the two of us. Very grateful that the day I made this, we had a ton of people over for a barbecue. Hey Gerry, good to meet you! Definitely some cringe-worthy stuff in the archives of B&B, but I maintain that they’re some of my favorite recipes. Especially my mom’s salsa. That was a brilliant move using the Fruit Thins! Now I must do it! *takes a bow* Why thank you! Can you imagine the fun you could have with all the different flavors they have? I’m betting the chocolate raspberry fruit thins, with raspberry jello and raspberry yogurt would be a total winner. Your pie looks creamy wonderful and I’ve never heard of Newton Fruit Thins but I want to give them a try. Lisa, there are tons of flavors of those Fruit thins too. Fig & Honey is a favorite, as is the Cranberry Citrus Oat. Kate, we love pineapple too. I just had to laugh though. You should have seen my face, seconds after I added the yogurt, to realize it was pineapple instead of lemon. Yum!! 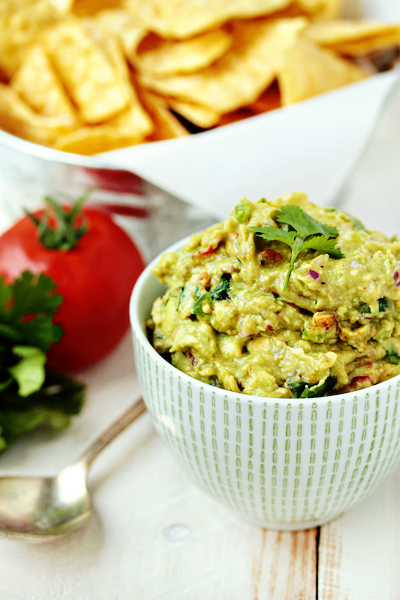 Great flavor combo, and it looks so creamy and delicious! Thanks, Jaid. It definitely was! What a nice summer pie! It’s nice to meet you Amber, although I have to say I have lurked her before. 😉 Don’t you love this pie?? It’s so versatile and I love your flavors and your crust. Perfect for Summer! I love the flavor combination here. So refreshing and totally feels like summer. I love how simple this recipe is. Can’t wait to make it. Thanks, Amy! It was definitely a refreshing and tart pie. Perfect for summer. Oh my. That pie looks amazing! I’m totally obsessed with fruity cream pies lately, so this definitely has my attention! I loved how easy it is, Lesa. It came together in like 5 minutes!